For SQL Server running on Linux, our goal is to preserve the capabilities framed in the diagram above. We are starting to enable support for some of these solutions starting with the SQL Server v.Next Community Technology Preview (CTP) 1 release. 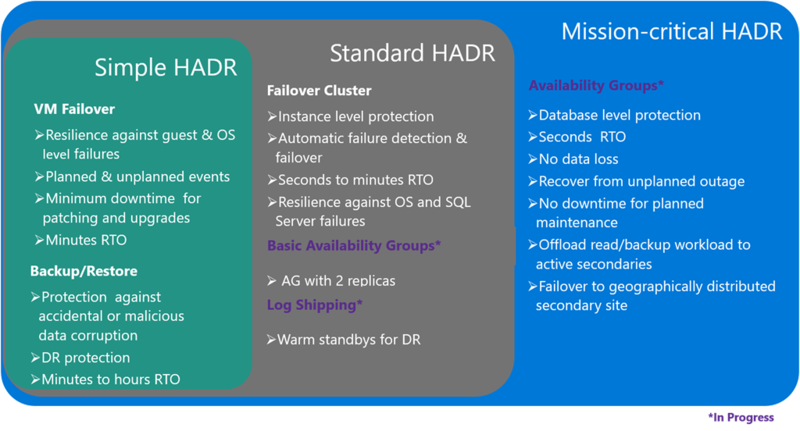 In Windows, SQL Server relies upon Windows Server Failover Clustering to provide the infrastructure features supporting the HADR scenarios. Similarly, on Linux platforms, SQL Server is natively integrated with popular clustering solutions like Pacemaker, so it can benefit from the health monitoring, failure detection or failover coordination of the clustering layer. Please visit our reference documentation on business continuity for SQL Server on Linux for more details about supported platforms and clustering solutions and end-to-end functional samples. According to the National Institute of Standards and Technology (NIST) public security board, SQL Server has the lowest number of reported security vulnerabilities across the major database vendors (NIST, February 2016). With SQL Server 2016, security was further enhanced by additional security features such as Always Encrypted, Row-Level Security and Dynamic Data Masking. This layered approach to data security, in addition to Microsoft’s overall commitment to advancing security and privacy protection, enables enterprises to secure their data and achieve regulatory compliance more easily than ever before. You can find out more about these enterprise-grade security capabilities as well as HADR solutions planned for SQL Server on Linux by watching the video above. The clip also includes a demo on how to register a SQL Server instance to be part of a Linux cluster setup using Pacemaker, as well as a demo on how to migrate an encrypted database from Windows to an instance of SQL Server running on Linux. Sign up to stay informed about new SQL Server on Linux developments. Stay tuned for additional SQL Server Blog posts in the coming weeks, including connectors, and developer tools on Linux!